Some things need to be seen to be believed, while others need to be believed before they can be seen. 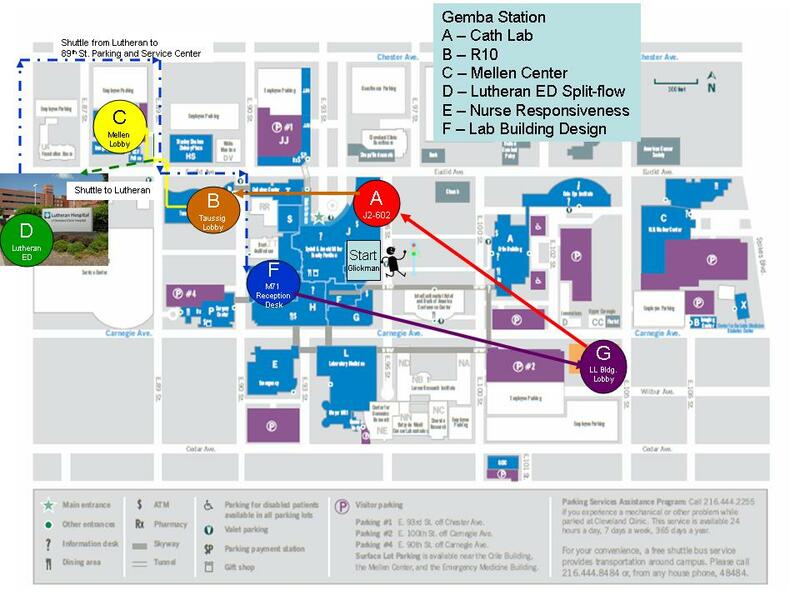 During the planning sessions for our recent Continuous Improvement in Healthcare Conference at the Cleveland Clinic, we were discussing the logistics of our optional Gemba day visit for our guests. 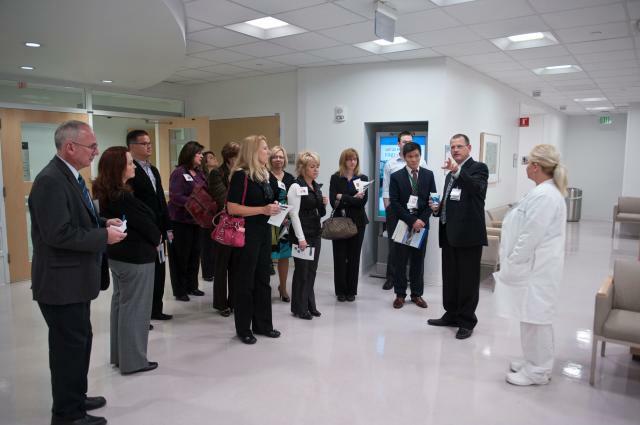 Earlier this year, we hosted approximately 50 people from member organizations in the Healthcare Value Network during a Gemba visit. We selected six sites to visit, broke the larger group into 6 smaller groups and established a golf tournament “shotgun” start process that had each group starting at a different location, then rotating counterclockwise through the series of 6 locations throughout the day. We even added a visit to one of our regional hospitals one week prior to the event, requiring a 30 minute shuttle drive. The day came off without a hitch and the best words I heard all day were from a participant who said “We haven’t seen any of the other groups!”. To me, that indicated success, because we designed the process to keep the groups apart. 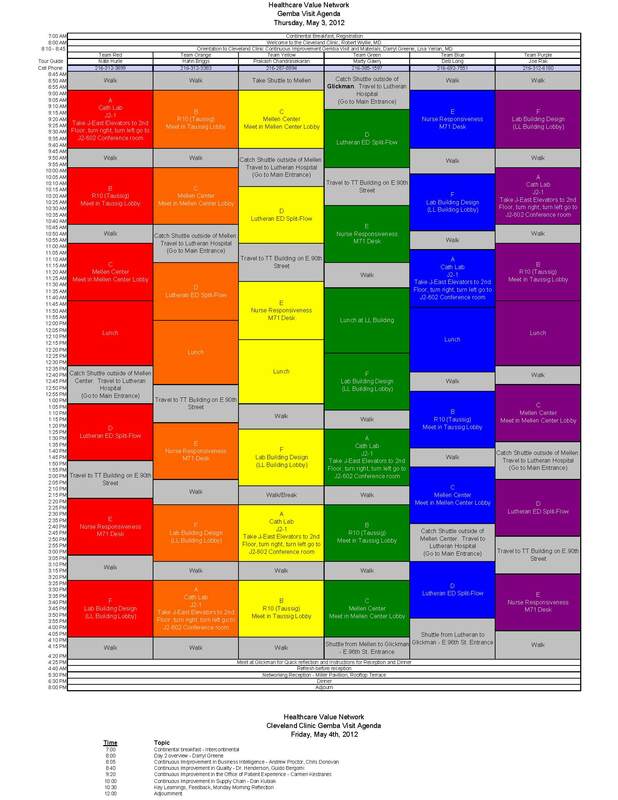 If they had seen each other, it would have meant that our Gemba guides or host locations had not met their takt time. Everyone had a full day and made it back to where they belonged at the end of the day. We received very positive feedback on the planning and logistics. 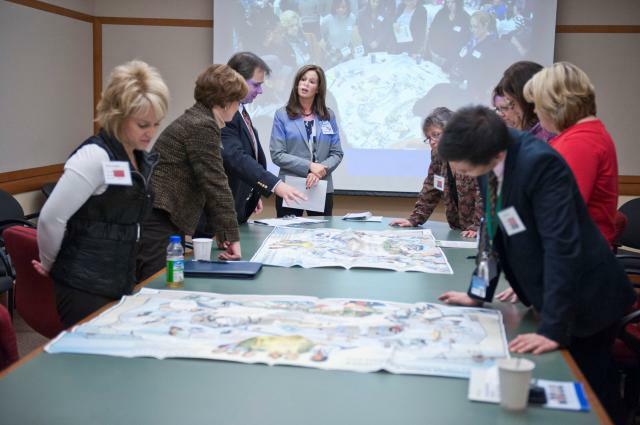 So when we started to plan the Gemba visit for our recent Conference, everyone wanted to use the same process. Why mess with success? However, things were different this time. Instead of a full day, we only had a half day. We also were planning on hosting up to 72 people vs. 50. One other big difference, we were asking people to pay to see our sites, while the HVN Gemba visit represented an obligation on our part to share with other member organizations. As a result, we needed to ensure that the visit was value-added. Since we only had time for 3 site visits, planning team members suggested we establish 3 routes and force participants to choose a pre-determined set of sites. None of us felt qualified enough to guess on how to group 3 sites together to satisfy everyone. So how to manage the logistics of such a visit? Additional constraints included keeping the group size to below 12 participants, while offering enough locations to accommodate up to 72 people. We choose a “FedEx” hub and spoke process. Participants would be given their choice of 3 of the 6 available sites and rather than rotating people from site to site, we would gather in a central location, send people out to their sites, then bring them back to the central location, shuffle, then go back out. 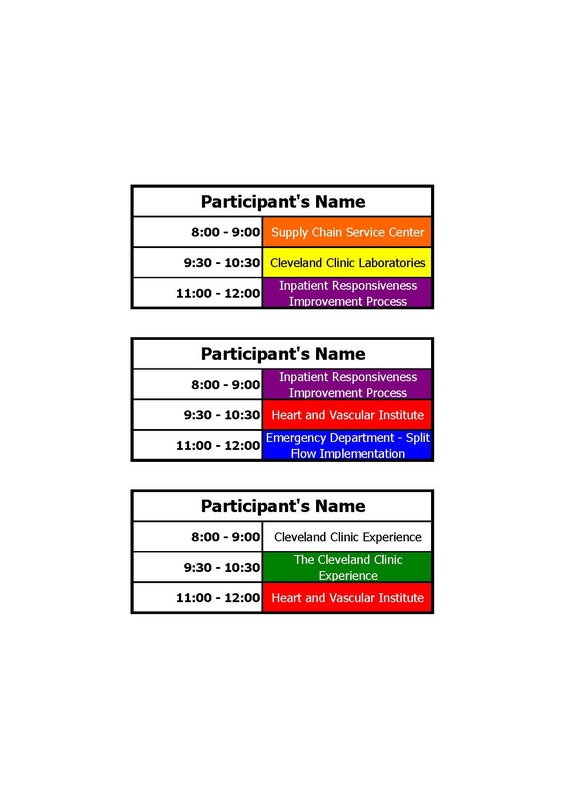 Participants received a name tag with their color-coded choices for their 3 gemba sites. 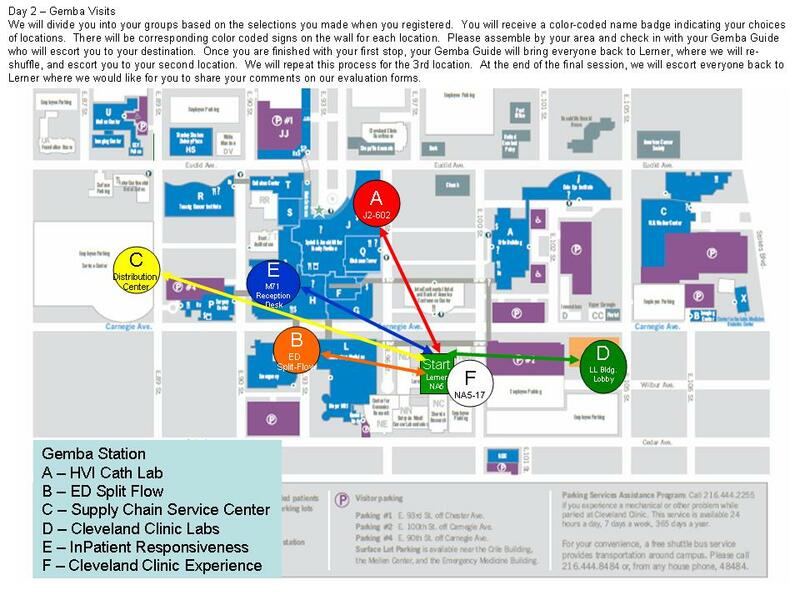 We posted color-coded Gemba signs in the Gemba central hub location and when every group had returned to the central hub, we asked everyone to “shuffle” for their next site. Gemba guides also had color-coded name tags to help with the proper identification of the location of the tour. As we gathered at the start of the day, everyone was anxious to see how the “Gemba Shuffle” would work. Participants signed in, received their name badges and we gathered in a conference room to explain the logistics of the day. 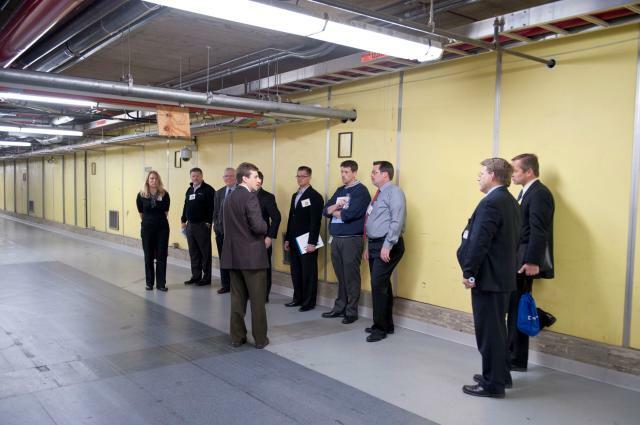 Once we explained the process, everyone went to the hallway to find their group for their first gemba stop. 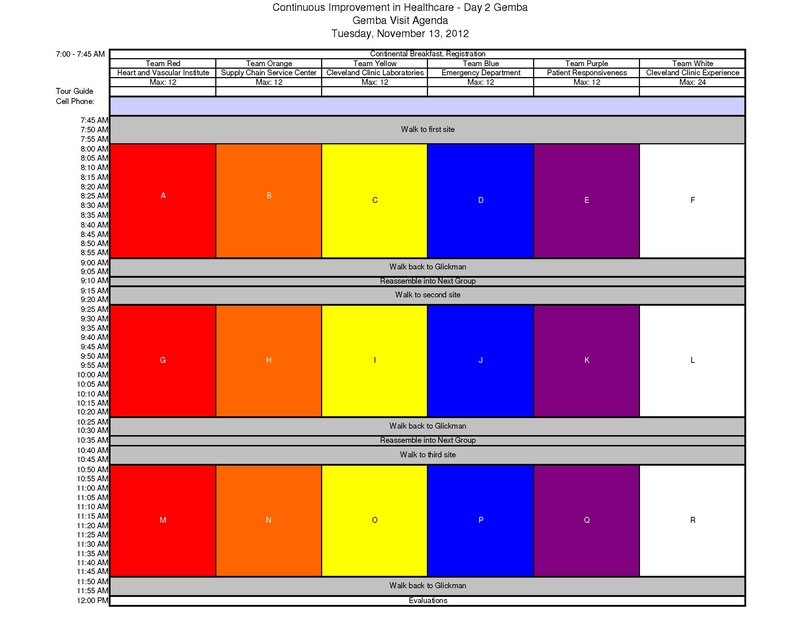 Gemba guides were given a list of people scheduled for each time slot and checked off participants as they gathered. Once they accounted for everyone, the gemba guides set forth on their journey while we sat back and awaited to see if everyone returned on time. As the first groups started to return, our focus shifted to seeing if the “shuffle” would occur without a hitch. While attendees were waiting for their next trip, we provided “posters” of improvement projects that our CI group had worked on throughout the year to showcase some of our work. Attendees found the posters an interesting distraction while waiting. At the appointed time, I made an announcement that it was time to “shuffle” and report to their next Gemba station. People moved, assembled at the right location and went off to visit their second site. The process repeated one more time and everyone ended up seeing what they wanted to see and no one was lost. Benchmarking is necessary sometimes in order for people to see a process work before they believe that it will. Other times, proper planning and thinking through a process are required before the end results can be seen. The key is to not blindly try to replicate a successful tool or system, rather, understand the problem that the tool or system is trying to solve, then adapt, don’t adopt to your current problem. 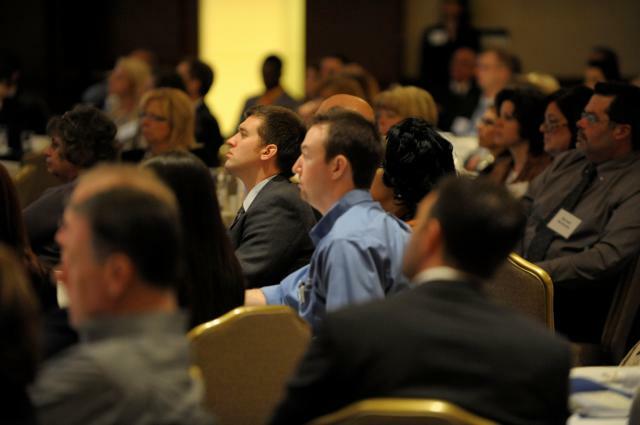 Earlier this month, the Cleveland Clinic hosted our first Continuous Improvement in Healthcare conference. What fun we had while learning. We were very pleased with the results for a first year conference, and have many people to thank for our success. There are many components that need to come together for a conference to succeed. The speakers of course make a huge difference. Ours were some of the best…John Shook, Dr. Patricia Gabow and Alice Lee, along with our own Dr. Lisa Yerian and Darryl Greene. Breakout presentations are also important. Again, we had many high quality presenters representing Denver Health, Henry Ford Health System, Christie Clinic, Parkview Health and Akron Children’s Hospital, not to mention the 9 presentations from Cleveland Clinic personnel. Thanks to all of our breakout session presenters for sharing your time and your experiences. Our Gemba day worked just as planned when we hosted over 50 people at 6 different sites and allowed participants the opportunity to choose which 3 of the 6 locations they wanted to visit. Using a hub and spoke process, we effectively sent people out to the Gemba, brought them back to a central location, shuffled and then sent them out to their next location. All of the success couldn’t have occurred without the support of our sponsors and exhibitors. Their participation and their financial support enabled us to offer the conference at an affordable price for participants and for us to break even financially. AbbVie (Abbott Proprietary Pharmaceutical Division). 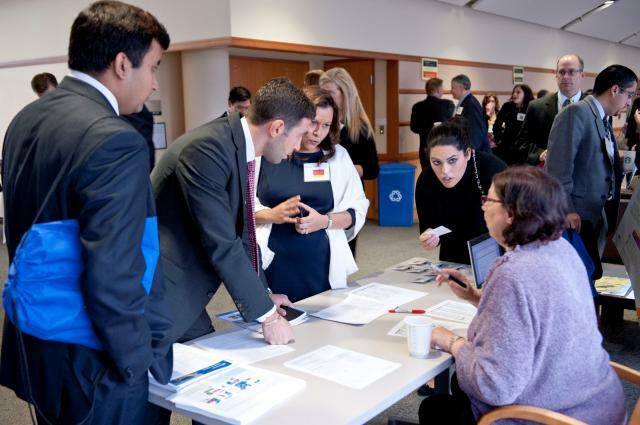 Our exhibitors provided interesting and valuable information for our participants. A special thank-you is necessary for GBMP (Greater Boston Manufacturing Partnership). They were the first to step up to be an exhibitor and without their initial commitment to our conference, we may not have been able to move forward. So a big thank you to my friends Bruce Hamilton and Pat Wardwell and the rest of the GBMP team for your support. The “Old Lean Dude” made an appearance. Additional exhibitors included: Corporate College (a division of Cuyahoga Community College), Explorys, Simpler Consulting, Cardinal Health, LEI (Lean Enterprise Institute), ASQ’s Lean Enterprise Division and the AME/ASQ/Shingo Prize/SME Lean Certification program, John Carroll University and IntelligentInsites. Thanks to all of our sponsors and exhibitors who helped make our initial conference a huge success! Finally, a huge shout out to the conference planning committee for pulling it all together. There were many lessons learned that we will implement as we start planning for next year’s conference.